The Renegade, Jeep’s entry-level vehicle with a starting price under $19,000, could be forgiven if it took the cooke-cutter approach. Crossover vehicles are so popular these days that Jeep could slap its badge onto almost anything with four wheels and sell a zillion copies. That plan seems to be working for other brands, which are launching small SUVs and CUVs as fast as they can ramp up the factories to make them. There’s only one problem: authenticity. 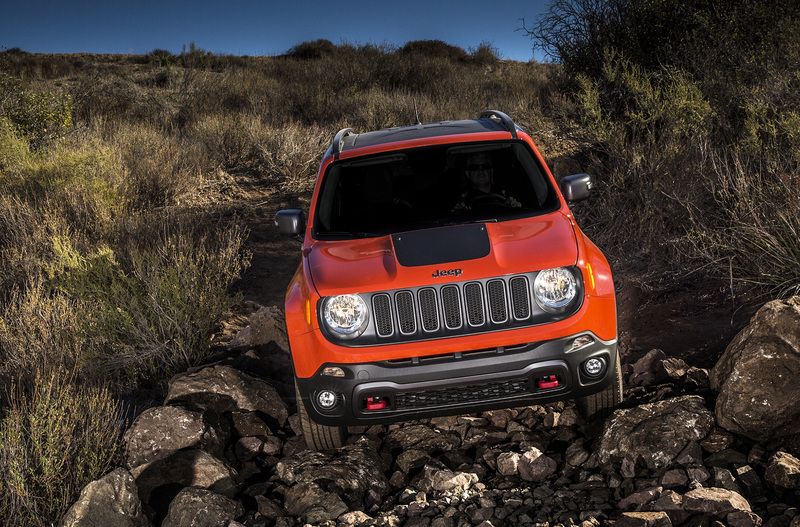 The Renegade takes the classic, boxy shape of historic Jeep models and rounds off the corners for a more modern look. It stands out for its appearance and real off-road capability amid a sea of cookie-cutter crossovers. Jeep has a reputation to uphold. More than a cheesy marketing gimmick, this brand with roots dating back to World War II is known for tackling some of the toughest trails on the planet. While base versions of the Renegade are clearly meant more for on-pavement cruising than off-pavement bruising, the version I’m driving this week has Jeep’s well-earned reputation riding on its muddy shoulders. The Renegade Trailhawk is the most affordable way to get authentic Jeep trail-climbing capability, starting at $27,095. While that’s a big-percentage price jump over the base model, it comes with some luxuries — such as push-button start and a 7-inch touchscreen with Apple CarPlay — along with a hefty list of off-road upgrades that make it worthy of the Jeep mystique. Skid plates help keep the transmission, transfer case, suspension and fuel tank protected from rocks. A 20-to-1 crawl ratio, 8.7 inches of ground clearance, generous suspension articulation and beefy tow hooks — painted in a bright, showy red — add up to some serious capability. Jeep says the Renegade Trailhawk can cross 19 inches of water and tow up to 2,000 pounds. While I’ve driven the Renegade on trails in the past, this week my experience was almost entirely limited to pavement, which is clearly not a native habitat for the Trailhawk. Keeping those skid plates perfectly clean felt a bit silly. Despite its tall, tough suspension and all its off-road-focused tuning, the Trailhawk version performed admirably the entire week, both on city streets and interstate highways. It was impressively quiet and reasonably comfortable for long drives, given its trail-ready nature. I like the overall look of the Renegade, an updated take on the classic boxy Jeep. I wasn’t as wild about the color combination of my tester, with its electric-green paint and rusty red accents in the cabin, a mix that made me feel like Father Christmas. My test vehicle, a 2018 model, was powered by a 2.4-liter, four-cylinder engine that sends 180 horsepower through a nine-speed automatic transmission. The combo feels merely adequate under acceleration like most of its competitors in this class, although the transmission offers a more responsive, engaging feel than some. The 2019 model year brings some additional changes, including a new 1.3-liter turbocharged four-cylinder engine, revised front styling, new wheel designs and a slightly better crawl ratio on the Trailhawk. An off-road suspension, tow hooks, traction settings, skid plates and more make the Renegade Trailhawk a legitimate performer on trails.